Sometimes stud earrings can become stuck in ears. This occurrence is particularly common in ears that have been recently pierced. 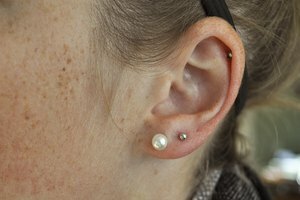 As the holes heal, they produce fluid and the skin tightens, making it difficult to remove the earrings at first. The key to removing stuck earrings is to be patient and gentle. A rough approach could cause serious injury and even promote infection. If the ears appear to be red, swollen or bloody, seek professional medical help as these symptoms point to infection. Wash your hands with antibacterial soap and water. Dry them thoroughly. 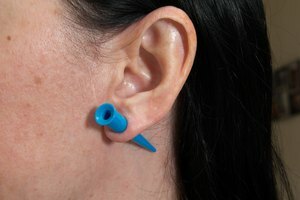 This step prevents infection, especially if the piercings are new or still healing. Wet down a cotton swab with warm water and swipe the cotton swab around the front and back of the post. Soak a fresh swab in piecing disinfectant and rub it on the front and back of the earlobe, making sure to get underneath the front of the post and the clasp, if possible. Grab onto clasp, pinching the front of the post and the earlobe with your other hand. Gently attempt to turn the clasp in a circle on the post to loosen it. Work the clasp back and forth in a gentle seesawing motion until it works its way to the tip of the post. Tug gently on the clasp to release it. Use a cotton swab soaked in warm water to clean the area if it seems sticky or crusty while removing the clasp. If the skin appears to be healed over the clasp, get a doctor's help. Grab onto the front of the post with pinched fingers and gently twirl it in the hole until it spins somewhat freely. Swipe the front and back of the lobe with warm water, then lightly tug on the post until it slides from the hole. This may take some time if the hole is tight. Wipe down the front and back of the earlobe with warm water and piercing disinfectant. Dry with a soft washcloth, then treat the lobes with antiseptic ointment if they appear red or swollen.